Lego models are usually too fragile to cope with outdoor play. Especially off-road outdoor play. And yes, those are pneumatic remote-control tubes going to this particular vehicle. Here are lots more pictures from the "Czech Lego Technic Truck Trial Championship 2008", organised by members of this Czech Lego forum. Making off-road Lego models is, I think, a good introduction to real full-scale engineering. A Lego truck trying to negotiate one-inch pebbles is taking similar risks to a full-sized vehicle trying to get over boulders. The Lego truck's much more likely to fail, for much more realistic reasons, than a "normal" off-road toy truck. This is because of the square-cube law, which makes it easy to make a model that's far stronger than a full-sized version would be. 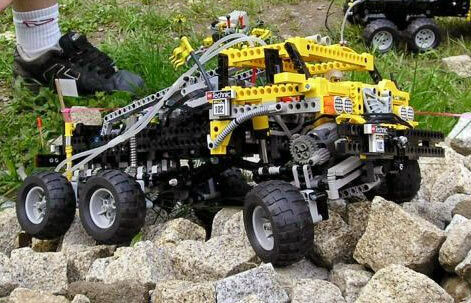 The connections between pieces of Lego are weaker than the connections between the components of a normal off-road R/C toy, which makes the challenge more realistic. If you build a small bridge out of Lego, you can just stick together a few layers of beam pieces using nothing but the standard stud connectors, and it'll work. This sort of thing doesn't scale at all, though, as many kids facing the classic "Spaghetti Bridge" challenge have discovered. In scale terms, spaghetti behaves like steel. As, for that matter, do the engineering components available to you in the old Bridge Builder game and its descendants. In those, the girders are stiff and strong, but they're nowhere near long enough to bridge the gaps all by themselves. And the joints with which you stick girders together are all perfect hinges, and not very strong in tension. Getting a tracked Lego vehicle to work properly offroad, and not throw a track every time a tiny stick or pebble gets jammed in there, would be a serious challenge. 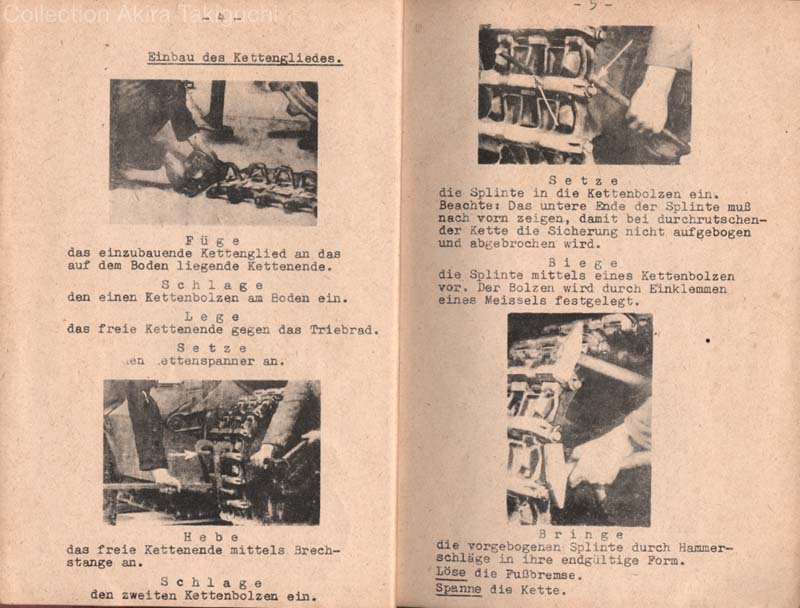 It might also give you some sympathy for the people who have to spend three hours with a sledgehammer, a two-by-four and who knows what else, fixing full-sized tracked vehicles that've done the same thing, in some delightful place or other. Crikey, that's 2/3 the weight of my wife's car! I also like how the new guys say, "That's not bogged!" Bridge It was a great game, though it is difficult to get working on modern hardware, I think due to very picky video card code. We used to do a bridge-building challenge in Structures at uni - the rules were 1m span, loading at mid point, materials cotton thread and balsawood. Winner decided by effiency - load / mass of bridge. Most students struggled with their one bridge. Using 12 years of balsa aircraft experience, my first bridge was finished in 10 minutes, so I built 2 more - a 'heavyweight' (it weighed nearly 70g!) and my favourite - the 'cheater' which had a ribbon of carbon fibre laminated into the balsa. Most students bridges held 4, sometimes a massive 5kg of barbel weights, with their +500g monstrosities, my 50g main entry failed at 29kg when some fool prodded it and the beam toppled sideways, causing my cotton tensile thread to turn into knives. Hearing 29kg of iron fall 1m onto a concrete floor at the top of a 5-storey 1960's building makes loud bang, and the whole building shuddered. We ran out of weight for my heavyweight, and I sat on the carbon one (I weighed about 55kg back then) and it flexed a little bit. If I knew the word 'pwned!' then, I would have used it. Armadillo Run probabily qualifies as a bridge-building software of sorts. Though it has little to do with modern bridges, it's still fun. Is there any freeware bridge-building simulation? You can read about how to use it in the resources tab on the same page. "...based on realistic specifications, constraints, and performance criteria." Sorry, guys - what's the point, if I can't build a bridge that starts out looking like the Eiffel Tower upside-down then falls across the gap just in time to catapult the train forward so it bounces off a cactus and rolls up into a ball that flies back off the left side of the screen and thus technically completes the level? Dan, I think what you're looking for is Bridge Builder/Pontifex II.. It's a somewhat but not TOO realistic bridge-building game, and is a lot of fun.